ABI4 is a transcription regulator that probably binds to the GCC-box pathogenesis-related promoter element. ABI4 also binds to the S-box (5'-CACTTCCA-3') photosynthesis-associated nuclear genes-related (PhANGs-related) promoter element, thus acts as a transcription inhibitor. ABI4 is involved in the regulation of gene expression by stress factors and by components of stress signal transduction pathways. ABI4 confers sensitivity to abscisic acid (ABA), and regulates the ABA signaling pathway during seed germination, upon nitrate-mediated lateral root inhibition, in hexokinase-dependent sugar responses (including feed-back regulation of photosynthesis and mobilization of storage lipid during germination), and in response to osmotic stress mediated by NaCl, KCl or mannitol. ABI4 plays a role in sucrose sensing or signaling, especially at low fluence far red light. AABI4 is also involved in plant response to glucose treatment, especially at low concentration and in young seedlings. ABI4 is required for the trehalose-mediated root inhibition and starch accumulation in cotyledons, probably by inhibiting starch breakdown. However, ABI4 seems to not be involved in sugar-mediated senescence. In addition, ABI4 is required for the ABA-dependent beta-amino-butyric acid (BABA) pathway. Rabbit polyclonal antibodies were produced by immunizing animals with a GST-fusion protein containing the C-terminal region of arabidopsis thaliana ABI4 (AT2G40220). Antibodies were purified by affinity purification using immunogen. Fig 1. 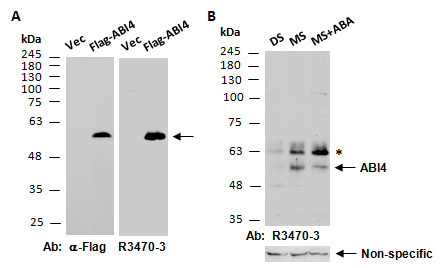 A) Western blot of protein extracts from human 293T cells transfected with a vector control (Vec) or a vector encoding Flag-tagged Arabidopsis ABI4 (Flag-ABI4), using the indicated Abs at RT for 2 hrs. B) Western blot of protein extracts from wild type arabidopsis dry seeds (DS) or germinating seeds in MS medium (MS) or in MS medium with 10uM abscisic acid (MS + ABA) for 4 days, using anti-ABI4 (C2) (R3470-3) at RT for 2 hrs. The same filter was reprobed with a non-relevant antibody for the loading control. The 63 kD band indicated by * may represent a modified form of ABI4. Protein samples were prepared using 4xSDS sample lysis buffer.